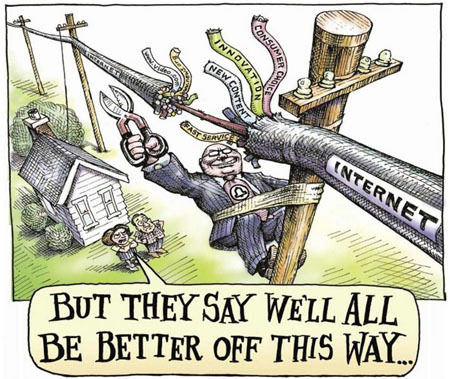 At its simplest, net neutrality holds that just as phone companies can’t check who’s on the line and selectively block or degrade the service of callers, everyone on the internet should start on roughly the same footing: ISPs shouldn’t slow down services, block legal content, or let companies pay for their data to get to customers faster than a competitor’s. In this case, we’re also talking about a very specific policy: the Open Internet Order, which the FCC adopted in 2010. Under the order, wired and wireless broadband providers must disclose how they manage network traffic. Wired providers can’t block lawful content, software, services, or devices, and wireless providers can’t block websites or directly competing apps. And wired providers can’t “unreasonably discriminate” in transmitting information. The FCC has been trying in one way or another to implement net neutrality rules since 2005. The FCC classifies broadband (such as FiOS) as an information service under Title I of the Communications Act, resulting in less strict rules than the ones applied to common carrier services (such as the traditional phone system) under Title II. But since both services are delivered over the same wire, Verizon FiOS is able to reap the benefits of utility regulation without the downsides. Much more in this article as well. Bits are bits. This is the point I have been pushing. Like water companies, electric companies and even telcos. There should be no fast lanes. There should be no place where they discriminate between bits. They are the water or electric company of the Internet. they provide the pipes that the data rides through. They should be simply providing the bits and not discriminating between them. If they start discriminating between the bits, they set themselves up as the gatekeepers of the Internet. It opens the door to invasion of privacy and discrimination. It also stifles innovation by making it easier for big business to control the industry. It makes it exponentially harder for the next “Google” or “Yahoo” or other disruptive innovation to take off. If Google or Yahoo had to pay for fast lanes for their customers in the early days of the Internet, they never would have made it out of the gate. Neither will the next innovative and disruptive technology. And we will all be the losers if that happens. It will also make it harder for small businesses in general that might have an online component to their business to provide competitive services because they can’t afford to pay for those fast lanes. This will be true of small businesses that provide remote services as well as hosting, etc. I think it is very important to contact the FCC and submit your thoughts on this very important issue of Net Neutrality which will affect us all in one way or another. Even if we are just users of the Internet, we will also feel the monetary impact, as well as freedom and privacy impact, and innovation impact. We always do. Thus, Congress has an important role to play in the struggle for a neutral Internet. We know that members of the subcommittee are planning to re-write the Communications Act, and we know that letters from Congress members aren’t taken lightly by the FCC in the rulemaking process. That means it’s time to let our elected officials and the FCC know that we will fight to protect the future of our open Internet. Today, tweet your questions for FCC Chairman Wheeler during the Communications and Technology Subcommittee hearing using the hashtag #AskWheeler. Call your representative. Let’s be clear: any rules that allow Internet providers to discriminate against how we access websites would be a disaster for the open Internet. Submit comments in the FCC official rulemaking process. We’ve made it easy with our DearFCC.org public comment tool. It’s time to fill the FCC’s Open Internet docket with our voices and our stories. After all, it’s our Internet. There are no easy solutions. But the FCC and Congress both want and need to hear from us. So let’s give them what they ask for. Let’s defend our Internet.